There’s something about age that does wonderful things to people. Shah Rukh Khan and Kajol have always had great on-screen chemistry, but the 22 years that have passed since they were first seen together in a film have added an unfathomable, heart-wrenching element to their pairing. Team Dilwale should send up a prayer of thanks for this saving grace, because this is the first time the two have been called upon to carry a film through on the strength of nothing but – absolutely nothing but – that chemistry. If you draw a sketch of the basic plot points of Dilwale, you will see the promise there. How the lead pair meet, the misunderstanding that leads to a parting of ways and the seemingly improbable circumstances that reunite them are all believable and potentially entertaining. The problem with the film though is that the threads used to weave these plot elements together are so disparate, so jumbled and so loosely put together, that the result is a bland, lifeless film. Rohit Shetty, whose previous works could be accused of many things, but never a lack of energy, seems to have fallen asleep – perhaps with boredom? – in the director’s chair while making this film. That is one possible explanation for the lackadaisical nature of the storytelling from a man who in the past has given us Chennai Express and Singham (yeah yeah, I know it’s terribly unintellectual to say so, but I enjoyed both). All those cars careening about the screen cannot compensate for what feels like his own lack of interest in this project. All this fades into insignificance though each time SRK looks at Kajol. Not the clean-shaven, supposedly younger version of Shah Rukh in the film, but the older, wiser, bearded man whose role acknowledges his age with dignity and grace. When he gazes at her or even just throws her a fleeting glance, and those eyes we’ve been seeing now for almost 27 years brim over with love and longing, tedium recedes into the background. It is a look that makes you want to reach out and hug him, to reassuringly pat him on the shoulder, to tell him that all will be well, to scream out the truth so that she realises that it was all just a misunderstanding. 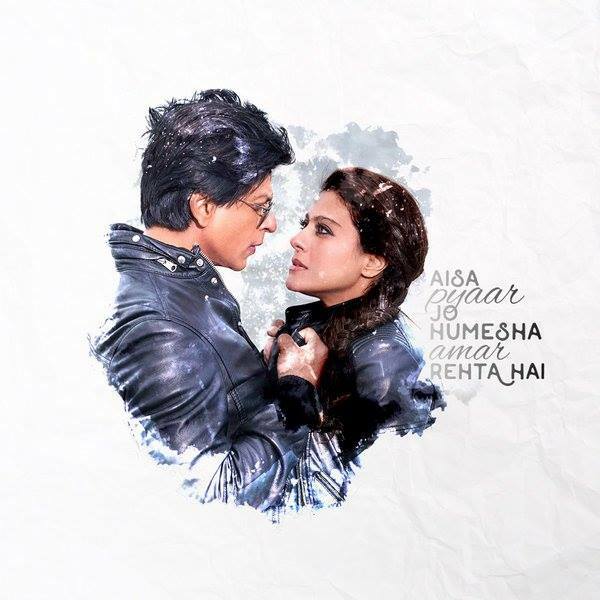 The return of the Kajol-SRK pairing five years after My Name Is Khan was supposed to be this film’s USP. As it turns, it is the film’s OSP – only selling point. Shah Rukh in Dilwale plays a gangster in Bulgaria called Raj Randhir Bakshi a.k.a. Kaali. Between shootouts and car chases during the course of his underworld activities, he meets Meera Dev Malik (Kajol) and they fall in love. A tragedy causes them to split up. When the film opens, the story has fast forwarded to the present in Goa where Raj runs a car modification workshop with his younger brother Veer (Varun Dhawan) who, at some point, falls in love with a pretty restaurateur called Ishita (Kriti Sanon). As you can imagine, circumstances cause Meera to return to Raj’s life. Dilwale’s primary characters are surrounded by a bunch of comedians who are occasionally amusing (Mukesh Tiwari and Pankaj Tripathi are hilarious in a scene in which they try to cover up Raj’s past in the face of Veer’s probing questions) but mostly not. Varun is sweet but really needs to give that cutesy dialogue delivery a rest. Kriti is given little to do, which is a pity because she has a striking, intelligent screen presence and was perhaps the only one worth watching in Tiger Shroff’s debut film Heropanti. Even the songs by Pritam are, for the most part, a damp squib. The music director redeems himself though with Gerua (in Arijit Singh & Antara Mitra’s voices) from which Amar Mohile borrows several bars for his background score. Both serve to play up the SRK-Kajol hotness to searing effect. SRK himself is magnetic and charming as the older Raj. He should seriously consider keeping that beard forever. Kajol is radiant, pretty and, with much less screen time than the hero, effective, though she should seriously consider junking those awkward high heels in future. It also feels sad to see how much she has whitened her skin from what it was when she began her career (he seems to have done likewise, though to a lesser extent). There is not much in the writing of Dilwale that could help these two recreate the sparks that flew between them in their earlier films, but they do radiate warmth for each other, a warmth that wafts off the screen and floats about the air in a sigh-inducing fashion. Each time Shah Rukh and Kajol are together in a frame, you can almost forgive Dilwale for everything else that it ought to have been but is not. Anna: A question on the film's overseas collection. There is an unanimous consensus that Bajirao Mastani is a better film than dilwale. This is evidenced by the film's collection in the domestic market as compared to Bajirao Mastani. With respect to the overseas markets, the film has done exceedingly well. This is strange considering that the overseas audiences are perceived more sensible and are adverse to slapstick stuff as against the audiences in India. Is the trend changing? I meant the way the typical NRIs project themselves to be. May be I was carried away by the perception.